The official start of summer has come and gone, and it's time to make some adventure plans if you haven't already. As summer advances and the temperatures stay high, hikers strive to find shade-covered, high-elevation, or simply water-covered areas to spend their time. Alpine lakes are the perfect escape from summer heat and offer incredible views almost 100% of the time. Be sure to check the current snow conditions as most of these hikes are not accessible until late July or August. Rainbow Lake. Photo by Duncan Sadava. 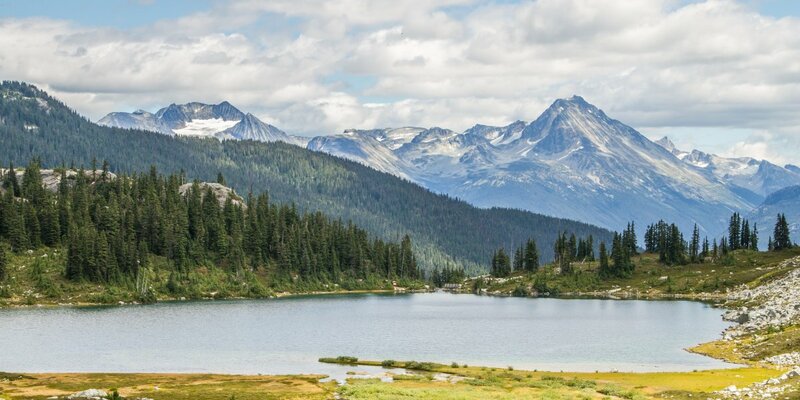 Rainbow Lake + Medeley Lake Hike: The Rainbow Lake Trail is one of the most accessible and iconic hikes in the Whistler area. This 20-kilometer trail climbs 900 meters, but it's well worth it. Ring Lake Trail: At 20 kilometers round-trip with just under 500 meters of elevation gain, it is a full day hike that is not excessively long; allow between five and eight hours hiking plus time for swimming stops. Lake Agnes + The Beehive Hike: Lake Agnes, located high above Lake Louise, is a popular destination for any visitor to Alberta's Banff National Park. This 11.27-kilometer trail takes you to a backcountry teahouse with incredible views. Gem Lake. Photo by Terah Mariet. 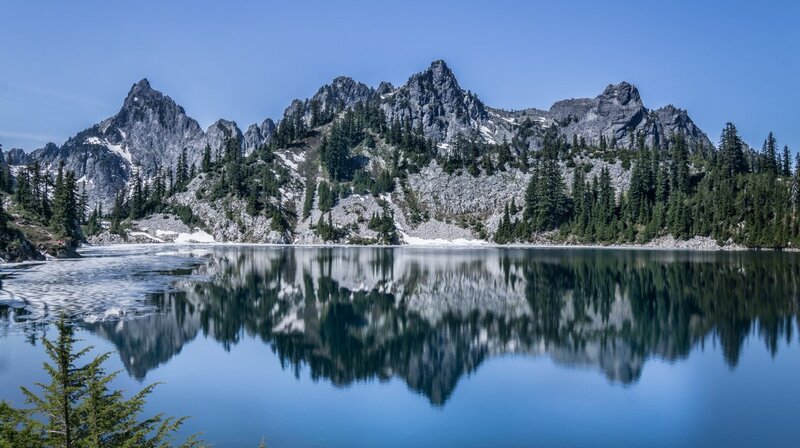 Gem Lake + Wright Mountain Hike: This 10-mile round-trip trail can be done as a day hike or a shorter backpacking option as there are a number of backcountry campsites scattered in the meadows near the lake. Thornton Lakes Trail + Trappers Peak: Like so many of the best hikes in North Cascades National Park, this trail demands a lot - 10.6 miles there-and-back and nearly 3,500 feet of elevation gain - but the reward of 360-degree views of the surrounding North Cascades and lake-filled cirques is absolutely worth the effort. Dewey + Anderson Lakes: A 10.5 mile there-and-back loop offering a brilliant display of wildflowers and stunning views of Mount Rainier and Goat Rocks. Eagle Lake: Nestled under the slopes of Mount Townsend and the rocky face of Merchant Peak, Eagle Lake offers camping spots as well as an abandoned trapper's cabin if you wish to make this an overnight trip. Snoqualmie Lake: The 13 miles are manageable as a day hike, but don't be fooled by the net elevation gain of 950 feet. One must hike over a ridge to get from Dorothy to Snoqualmie, so the total gain ends up being over 2,600 feet round trip. Lake Serene: The lake is nestled under the 3,000-foot crags of Mount Index, and it feeds the equally awe-inspiring Bridal Veil Falls below. The hike to the lake is just over 3 miles, so be sure to allow time for taking a dip in the lake. Ice Lake in the Wallowas. Photo by Bryce Jenks. Chambers Lakes: Set in the saddle between South Sister and Middle Sister, Chambers Lakes are the highest accessible lakes in the Cascades. It's a 20-mile hike into the lakes, but the views and plenty of campsite options make it an ideal backpacking destination. 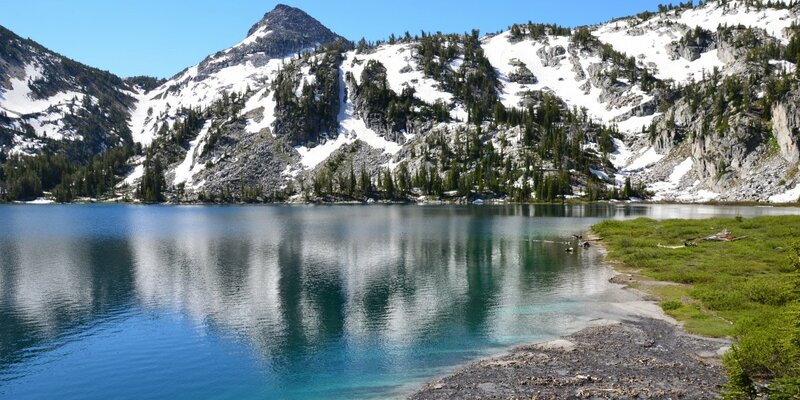 Ice Lake: You’ll find yourself encircled by jagged, often snow-covered peaks and incredibly clear blue waters once you've hiked about 10 miles into the Wallowa Mountains. Broken Top Crater: Make the hike to the 8,150-foot Broken Top Crater to view a gem replete with a deep, turquoise pool and a sweeping view of the Three Sisters and much of Eastern Oregon. Sawtooth Lake. Photo by Matt Leidecker. Alpine + Sawtooth Lakes: The close proximity to Stanley, relatively short hiking distance (9.6 miles there-and back), and stunning views along much of the trail makes this one of the most popular destinations in the range. Saddleback Lakes: A relatively short and steep hike (the steepest in the Sawtooths!) makes this a nice day trip for experienced hikers. The stunning southwest face of the Elephants Perch towers over granite slabs that slip directly into the waters of the lake. Alice + Twin Lakes: It could be enough to say that the backdrop to Alice Lake is one of the most stunning views in the entire Sawtooth Range. This 10.4-mile there-and-back will not disappoint. Lake Aloha: Lake Aloha is one stop on a typical 3-day backpacking loop in the Desolation Wilderness. If you have the time, you can even continue to Clyde Lake, which will be more secluded. Bear Lakes: The Bear Lakes Basin lies within an island of granite set about 20 miles northeast from the core of the Trinity Alps. In a 9.5 round-trip hike you'll find Big Bear Lake, Little Bear Lake, and Wee Bear Lake. 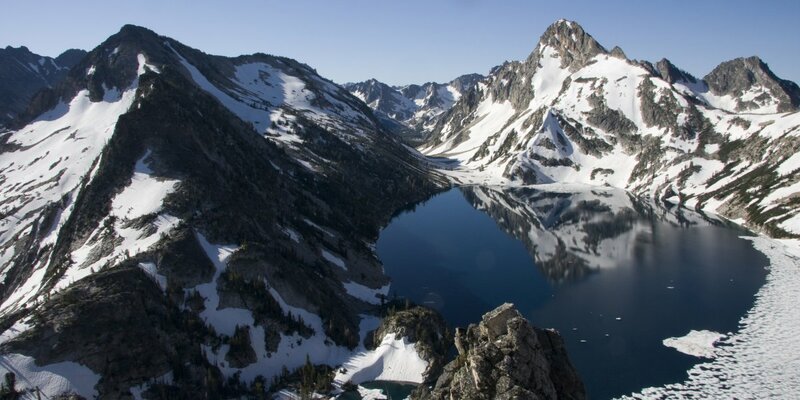 Emerald + Sapphire Lakes: Sapphire and Emerald Lakes are nestled comfortably among granite ridges in the heart of the Trinity Alps. This 13-mile trip can be done as a long day hike or an ideal overnight. Deadfall Lakes: Upper Deadfall Lake is found about 2.5 miles into the Mount Eddy Trail and makes a great spot to take in views of Mount Eddy. Stonewall Pass + Echo Lakes: It is a relatively steep 4.5 miles to get to Stonewall Pass and another 1.5 miles to Echo Lake. Like many of the other passes in the Red Trinities, you'll be treated to amazing views of the surrounding mountains including the dramatic White Trinities that spring up on the western side of Stuart's Fork. 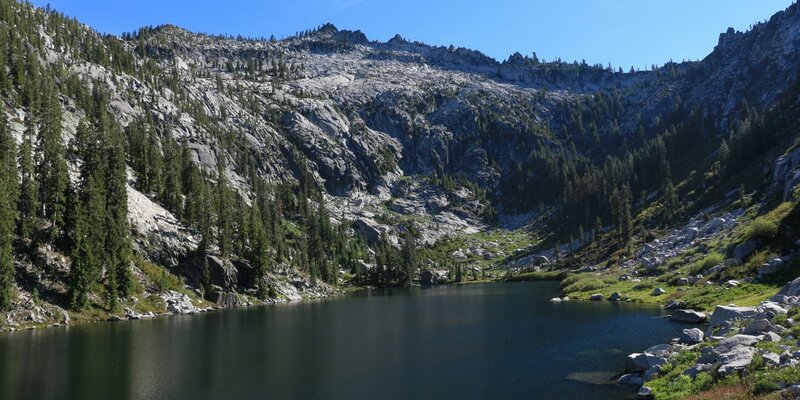 Alpine Lake: Alpine Lake is nestled against 2,000-foot granite ridges in the southwestern section of the Trinity Alps Wilderness. At 17 miles and 3,200 feet of net elevation gain, this is a great late summer backpacking destination. Blue Lake. Photo by Fernando Boza. 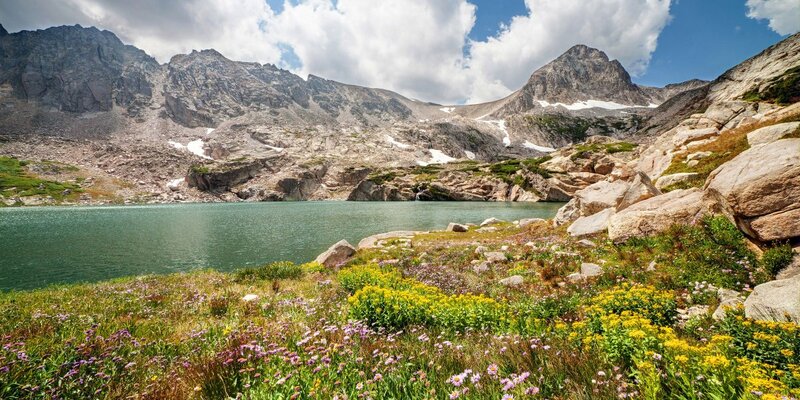 Missouri Lakes Loop: This is a great 13-mile loop route that combines two passes, several lakes, and wonderful vistas of the Sawatch and Holy Cross Wilderness. It is suggested that you do the route in a counterclockwise direction starting from Fancy Pass Trail #2006. Cathedral Lake Trail: Climbing 2,000 feet up a steady 3-mile grade, hiking the Cathedral Lake Trail offers an alternative to the crowds at the Maroon Bells. This hike is a great cardio workout that contains no shortage of alpine views as a reward. Ice Lake + Island Lake Hike: The hike up to Ice Lake and Island Lake in Colorado's San Juan Mountains is truly an amazing one. It is moderately difficult, clocking in right at 8 miles with a total 3,000 feet of elevation gain, but the waterfalls, fantastic lakes, and wonderful views below and above the tree line are absolutely fantastic. Gore Lake: The ski lifts of Vail Ski Resort may be just minutes away, but the 12.5-mile rugged trail hike to crystal clear Gore Lake elevates hikers 3,000-feet into a high alpine region full of scenery and seclusion deep in the Eagles Nest Wilderness of the Gore Range. Zirkel Circle Hike: The Zirkel Circle hike is a loop that connects the Gilpin Lake and Gold Creek Lake trail (1161 and 1150, respectively) in the Zirkel Wilderness just outside of Steamboat Springs. Mitchell Lake + Blue Lake: The trail to Mitchell Lake and Blue Lake, just over 6 miles round-trip with some 1,200 feet of elevation gain, makes for an easy to moderate day hike with beautiful scenery and abundant wildlife. Chasm Lake: The Chasm Lake Trail is a high alpine gem of a hike within Rocky Mountain National Park. The lake shadows the base of the Diamond face of Longs Peak, which towers 2,456 feet above Chasm Lake. This elevation is all the more impressive considering the lake already sits at 11,803 feet. Sundial Peak over Lake Blanche. Photo by Kyle Jenkins. 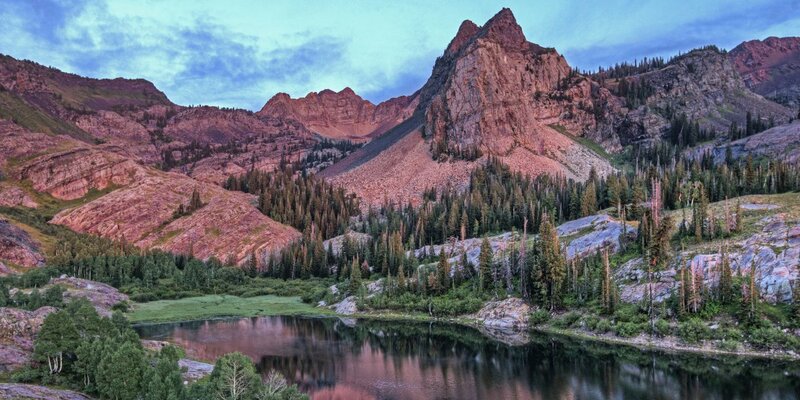 Maybird Lakes: Maybird Gulch is a rugged piece of the Lone Peak Wilderness in Little Cottonwood Canyon. This short 6.5-mile round-trip trail boasts picturesque alpine lakes and stunning views of Pfeifferhorn. Lake Blanche Trail: An absolute must-see for the aspiring Wasatch adventurer, Lake Blanche Trail is the perfect mix of challenge and accessibility. Nearly 4 miles up the trail lies a serene lake with a towering peak known as the Sundial. The jagged dual-spire reflecting in the water below creates a unique and breathtaking scene. Little hard to take this list seriously with MT's absence. Why weren't any alpine lakes in Montana included? They are some of the best in the country, especially in Glacier National Park.